Sushi restaurants are ubiquitous in Miami. Every corner has a sushi dig claiming to have the freshest and most innovative roles. Some are good and most are mediocre. 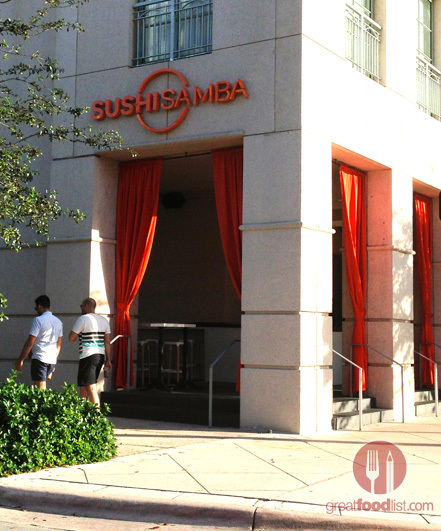 We won’t lie and say we weren’t a tiny bit hesitant when visiting the Coral Gables location of Sushi Samba. The Miami Beach wing is constantly flocked with tourists who are hoping to bask in the Lincoln Road sun and sometimes care little about the food. However, we hesitantly ventured and were pleasantly surprised. 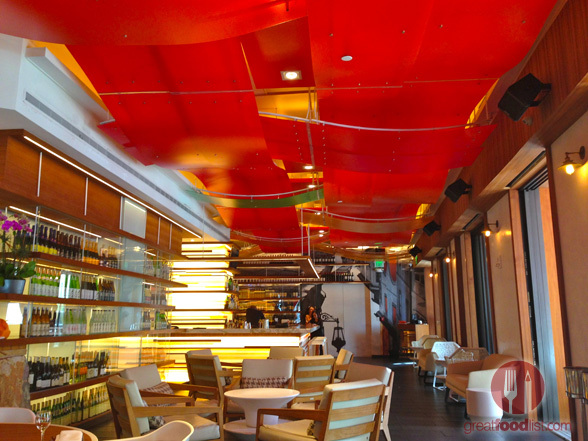 The 6,500-square-ft space of Sushi Samba Carol Gables is located in the midst of all the Gables fun on the corner of Aragon Avenue and the heart of Miracle Mile. 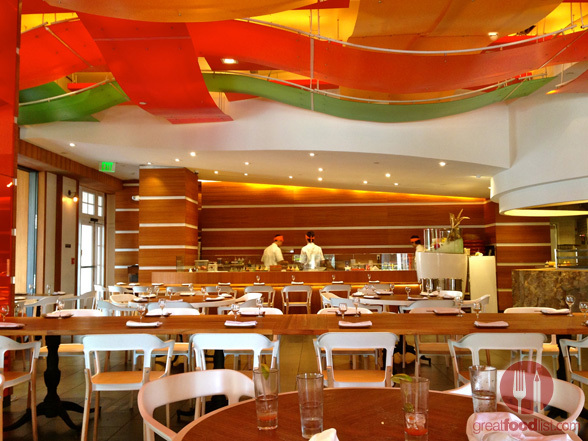 The delightful menu features cuisine from Japan, Brazil and has a huge Peruvian influence. 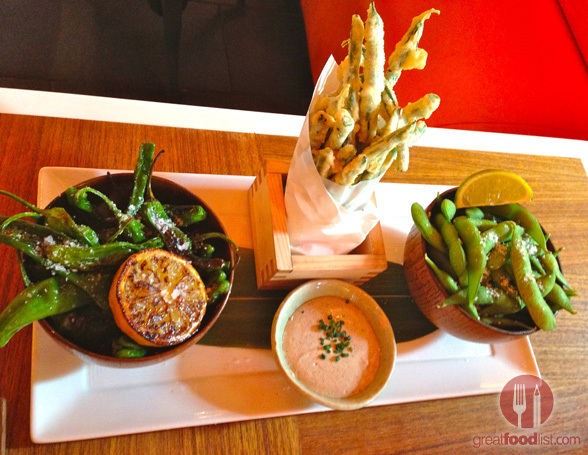 We started our colorful lunch with the Otsunami ($15) appetizer, which is an assortment of edamame, green bean tempura, and shishito. Otsunami means, “snack” in Japanese, and this appetizer was the perfect combination of traditional and modern Japanese cuisine. Our favorite of the three samplings was the shishito, sweet peppers sprinkled with salt, that had us hooked from the very beginning. We were off to a good start and continued our lunch with the Crispy Taquitos ($6) from the menu’s small plates. The taquitos were served with a side of spicy aji panca (smoky taste with a lingering heat) and fresh lime. 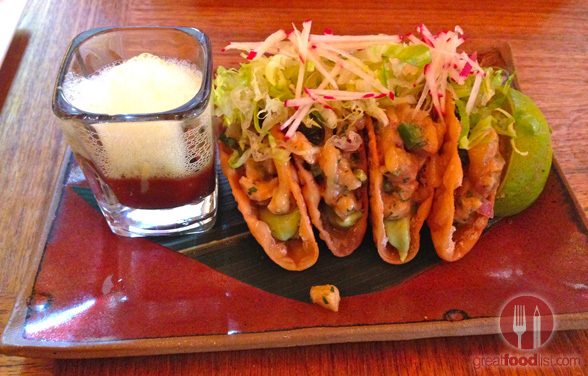 The tacos had Yellow tail, avocado and roasted corn miso and were just the right size. The unexpected bit of avocado in each taco also gave them a great smooth and almost buttery taste. We also tried the Sashimi Tiradito Assortment of Four ($35) from the raw offerings in the menu, which we highly recommend for an extreme palate journey. The assortment brings Yellow tail sashimi with jalapeño and lemon grass; Kanpachi with yuzu (think lemon taste) with sea salt and black truffle oil; tuna with granny smith apple (a sort of apple sauce puree on top); and our very favorite, Serrano lime and Salmon with yuzu caviar, Asian pear, red jalapeño and ponzu (citrus-based sauce.) All the tiraditos were bursting with flavor, each uniquely different, but if you have to go with one, the salmon is our choice to try. As you would in any sushi restaurant, we gave their roll selection a try and kicked things off with the Samba Coral Gables ($19) roll. This was undoubtedly the standout dish of the lunch. It had steamed lobster, avocado, red jalapeño, spicy Japanese rice crackers, sweet chili, key lime mayo and tobiko (has a mild, smoky taste.) 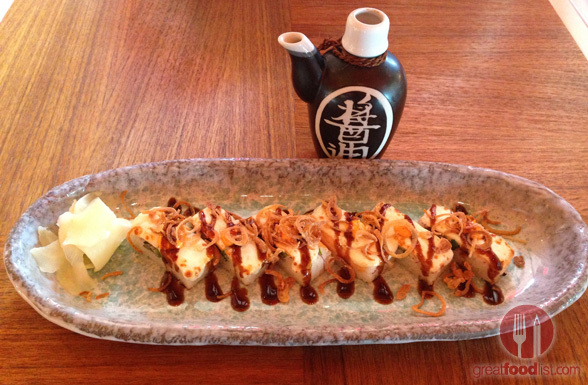 It was as good as it looks and dare we say one of the best Sushi rolls you’ll find in Miami. The second roll we tried had no resemblance to a traditional sushi roll, which we very much appreciated and enjoyed. El Topo ($14) brought salmon and jalapeño that lay on a bed of rice. A shiso leaf in the middle separated the roll between top and bottom, and the roll was topped with fresh melted mozzarella and crispy onion. The innovation was impressive as was the taste. We’re not exactly sure how, but we managed to squeeze in another dish, only this time from the Robata grill. 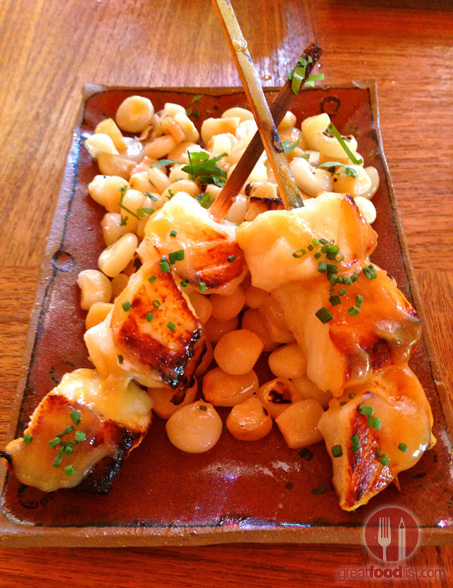 To culminate the great time we were having, we tried the Sea Bass Anticuchos ($16.) Overall, the sea bass was very fresh and was bathed in a honey glaze that dripped intricately and deliciously. Somehow the genius Sushi Samba Chef managed to also give us a dessert that didn’t overwhelm us even though we had splurged and been slightly gluttonous with our over-the-top food selection. 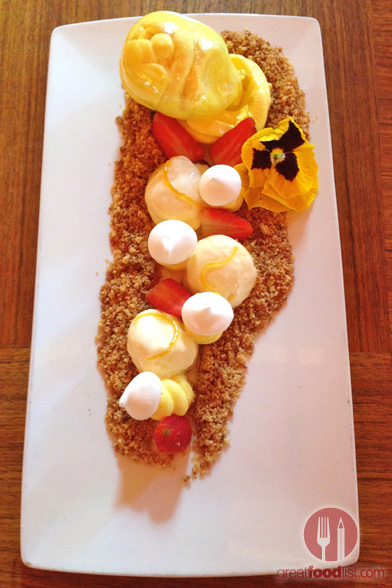 We tried the Yuzu cheesecake, which had traces of liquid nitrogen gastronomy and was inside a sugar sphere, sprinkled with graham cracker crumbles, baked meringue, a scoop of shiso ice cream (minty flavor), fresh strawberries and orange candy zest. This fruity concoction left us incredibly satisfied and solidified that this was undoubtedly one of the best sushi experiences we’ve had to date. The food was as good and artistic as it looks in our pictures. 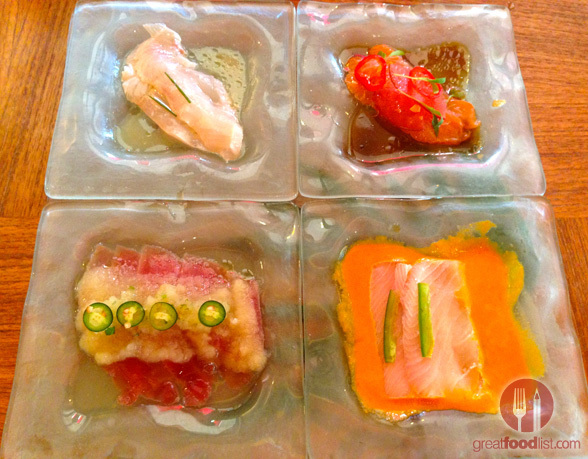 Mixing both traditional and new ingredients in unique ways, Sushi Samba did not disappoint. 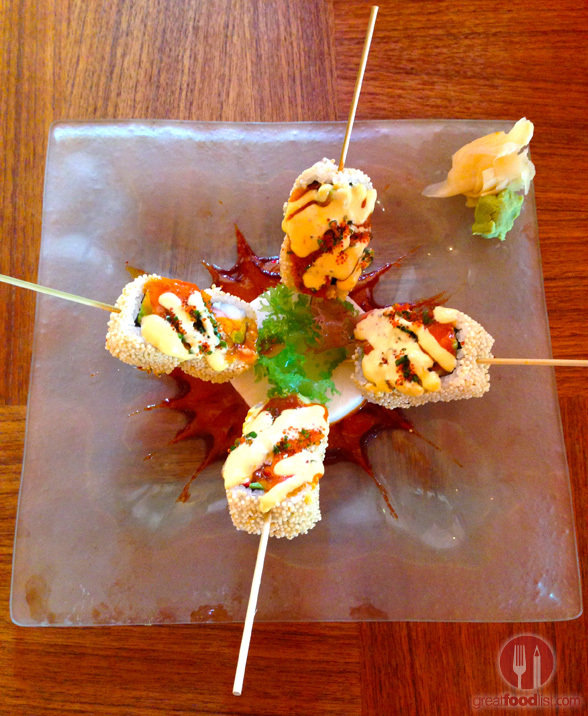 If you’re looking for the perfect meal, one that’s completely satisfying but not overwhelming, Sushi Samba Coral Gables is the place to visit. The restaurant also has the first robata grill and outdoor bar in the area, which makes this place all the more enticing!